The Sacred Sites and Pilgrimage Routes in the Kii Mountain Range are testimony to the Shinto belief and its fusion into Shinto-Buddhism. 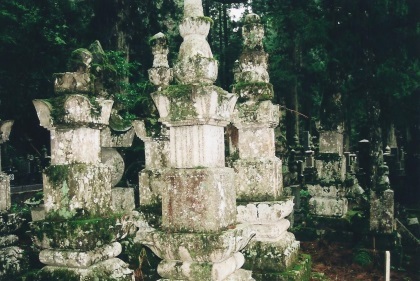 The three sacred sites lie in the forests of the Kii Mountains. They have attracted pilgrims since the 11th or 12th century. The most well-known part of this WHS - Koyasan - I visited on my second trip to Japan. This temple town has the usual Japanese abundance of souvenir shops and restaurants: don't expect it to be very serene. Most of the temples are grouped in the western part of town. Their designs are all very different. Okuno-In, the temple that houses the body of Kobo-Daishi, is on the other side of town. Going there you have to cross a large cemetary, covered in moss and hidden under huge dark trees. An experience not to be missed here is staying overnight in one of the temples. The local Tourist Information can arrange this. 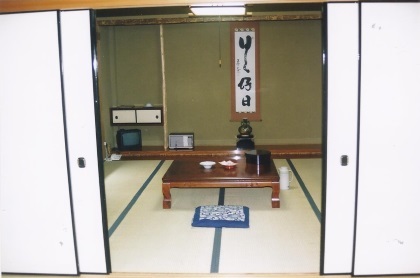 The Fudo-In was my accommodation: very quiet (only 2 young monks seemed to be living there), great food and a fine traditional bath. From all sacred sites and pilgrimage routes that were combined to be this WHS, I chose to visit Yoshino, the area that famous for its Sakura viewing in spring time and has long history that one time was the capital city of Imperial Court of Japan. From the ground, Mount Yoshino was a typical mountain on the Kii Mountain Range, but when entering the forest, many small shrines, torii gates appeared to confirm that this place was special. Visiting Yoshino was very accessible by train and cable tram which bring tourist from the city of Yoshino below to the village on the higher level of the mountain. From the station, the town was full of shop selling food and souvenir, not a sacred mountain as I was expected, but a typical Japanese tourist attraction. The central of the town was the Kimpusan-ji Temple which holding many Japanese national treasure. The star of the temple were the main temple gate, which guarded by a large statue of giant, the facial expression of the statues were truly exceptional realistic, and the temple's main hall which is the second largest wooden building in this country. After the temple, I continued my visit along the pilgrimage route to the top of the mountain, the view of Yoshino from the viewing spot along the way were really beautiful. The roof of Kimpusan-ji were dominated the skyline of the whole town. Apart from the religious sites, Yoshino was also famous for its sushi, which once a staple for pilgrims in ancient time and dessert made from Sakura flower which could be found in almost every shop. To be honest, apart from lovely local hospitality, I was quite disappointed to find a large commercialized village on the sacred mountain liked Yoshino, I could not find anything special since walking in Yoshino was similar to walking in Kyoto's smaller Higashiyama area. I did not know the situation in Koyasan and Kumano, which were another two areas of this WHS, to be similar to Yoshino or not, but if it was the same, this WHS surly will not be on my recommended places to visit in Japan for first time visitor. I started my visit to this site at Shingu and visited the three shrines in this area. The Hayatama shrine, set in a wooded area on the edge of Shingu town comprised several scarlet painted wooden buildings with tile roofs. The Hongu shrine was a 90 minute bus ride from Shingu passing several spa resorts along the way. 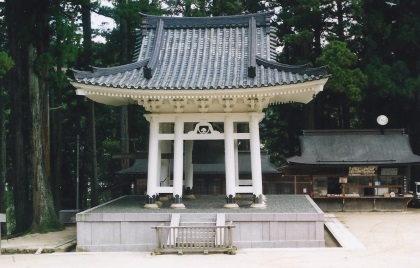 The buildings at this shrine were of natural timber with gold trimmings and with steep thatched roofs. The Nachi shrine and Sagantoji temple was a much larger collection of buildings, both natural and painted spread over a hillside. There is also an elegant scarlet painted pagoda. Buses to this shrine leave from Nachi station, a few stops along the line from Shingu. Many steps lead from the bus stop up to the shrine. Next I moved on to the Koyasan area and first visited the Jison-in temple in Kudoyama. This temple marks the starting point of the Koyasan Pilgrimage Route, with its 180 stone markers showing the route to the summit. 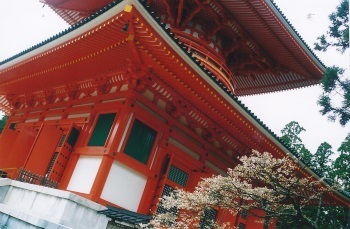 This temple was the resting place for women, as only men were permitted to ascend Koyasan. Today the temple is dedicated to women. I then ascended Koyasan using the train and cable car and toured the sites at the summit using the local buses. I went first to the Okuno-in and walked through a huge graveyard with interestingly designed tombs and reached the Torodo and Gobyo mausoleums. I also visited the Kangobuji temple and the ancient Danjo Karan shrine with its huge pagoda. The third part of this WHS that I visited was at Yoshino, a pilgrimage site on Mount Yoshino. 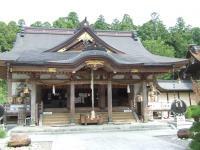 Here there are a number of interesting temples as well as traditional wooden dwellings, inns and shrines. I made the final ascent to the village by cable car from Yoshino station. This WHS has great religious significance in Japan. I went to Koya-san at the end of my month-long stay in Japan. Stayed at the Sekisho-in, at the east end of the town. After morning service (Shingon) and breakfast, walked to Kukai's mausoleum. The cemetery was serene, with the snow filtering down between the aged cedars. It was like an open-air cathedral, and the walk akin to a pilgrimage (which is probably how the Japanese experience it). My map indicated that many of Japan's military leaders have their tombs in the cemetery, and "burial" there is akin to that of Pere Lachaise in Paris. Later saw the Dai-to or great stupa/pagoda. Aside from its' proportions, I was more impressed by the three-dimensional manadala that was created inside. Apart from the artistic quality of the sculpture (which is modern), for me it conjured up the image of the 'axis mundi', that Borobadur in Indonesia does. Circumabulated the altar five times before departing. I'd go there again, though for many, it might remain a curiosity for them. In the motuary temple (just short of the actual mausoleum) a monk was conducting a fire ritual at one of the chapels. Famous suicides: Kongobuji Temple, Koyasan is where Toyotomi Hideyoshi's nephew Toyotomi Hidetsugu committed 'seppuku' (ritual suicide) in 1595, considered as one of the most shocking seppuku in Japanese History. Fusion: "unique fusion between Shintoism and Buddhism"
Toyotomi Hideyoshi: Yoshino is famous as a mountain cherry blossom beauty area, and it is said that the warlord Toyotomi Hideyoshi (1536-1598) who boasted overwhelming power at that time held a luxurious cherry blossom viewing party here in 1594. Sacred Forests or Groves: Nachi Primeval Forest, part of WHS, is a 32 hectare sacred forest covering much of the area to the east of Nachi no Otaki, the sacred waterfall . Discriminatory Entry Policies: Area around Mount Omine and Ominesanji Temple is out of bounds to women. 92 Community Members have visited.